I have an amplified digital TV antenna in the attic connected through a distribution amplifier in the basement to several spots in the house (for details see here). One signal from the amplifier connects to an HDHomeRun which is also connected to the home computer network . Using the HDHomeRun, my kids can watch TV on their computers in their rooms over the network when they are home sick. 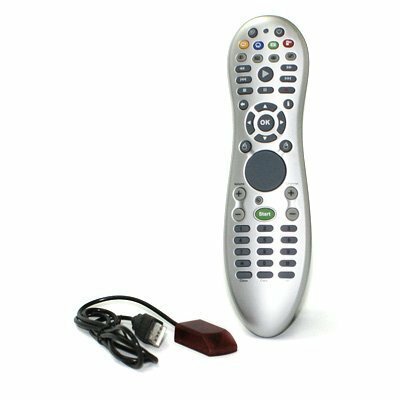 Using a low cost windows media center remote control, they can watch from their beds and get the full TV/DVR experience. With two tuners, two computers can be used to watch two different channels at the same time or you can watch one channel while recording another. You can add more HDHomeRuns for more tuners. SiliconDust also has a cable version of the HDHomeRun called the HDHomeRun Prime that uses cable card technology; I had one of these and it worked well, but we didn’t use it enough to justify the recurring cost of the cable card (Comcast charges excessively for these…some other cable companies are much more reasonable). The HDHomeRun tuners are pretty good and receive plenty of strong channels. The Windows Media Center user interface is very good and includes a free program guide. Picture quality is full HD. It’s a nifty solution at a very low cost. Linux users can watch using VLC viewer (included in most distros) or XBMC (setup) you may need to install hdhomerun-config. Setup involves running “hdhomerun-config discover” to get the tuner ID (see instructions). The amplified omni-directional antenna sits in the attic and is connected by coax cable to the distribution amplifier in my basement. The distribution amp takes the antenna signal amplifies it and splits it to feed up to 5 coax cables taking the signal elsewhere in the house (including the guest room where the ancient 27″ CRT TV lives). I was pleasantly surprised to receive nearly 50 channels including the major networks (ABC/NBC/CBS/FOX), smaller networks (USA, WB, ION, LWN, Cozi, Bounce, meTV, thisTV), lots of PBS channels, and some channels I’m not interested in (shopping/religious/Spanish). The reception quality is very good no ghosts or snow. The selection isn’t as good as cable (in particular I miss Comedy Central), but it’s not bad either and has plenty of decent programming including movies. The Tivo has a very pleasant user interface and automatically records movies and your favorite shows so you always have lots of good programming available to watch. The 1TB drives stores a ridiculous amount of video (144 HD hrs, 1367 SD hrs). This setup eliminates a cable box rental and provides a reasonable media solution that is enhanced with a DVD player with internet connection for Netflix, Amazon Prime, etc. With OTA TV, a good DVR, and cell phones, the only reason I still have cable is for the internet connection and for the cable TV channels Deana likes that aren’t available over the air. So the guest room has OTA TV and thanks to Tivo, dozens of good movies and shows recorded and ready to watch any time as well as access to the cable movies and shows recorded on the other Tivos in the house.